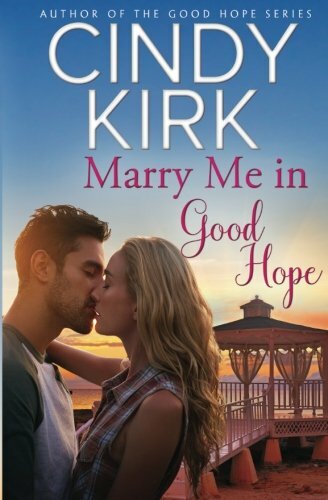 At 2:38 AM, I turned the final page on another emotionally satisfying trip to one of my favorite fictional small towns: Cindy Kirk's Good Hope. I hadn't planned to stay up half the night. I had tried to go to bed at 11:00 but, clearly, David, Hadley, and Brynn had other plans. ;-) I've read all of the books in this contemporary romance series and have become emotionally invested in many of the characters, including David and Hadley. I've been waiting to see where the author would take them when it was finally time for their story to be told. A successful architect and divorced, single dad, David Chapin is doing his level best to ensure his nine-year-old daughter, Brynn is happy and secure, especially after recent emotional upheavals in her life. When one more unexpected change - the marriage and departure of Brynn's live-in nanny - occurs, David is left floundering with no solution in sight for the month left before school begins again until - suddenly - the solution is standing right in front of him. Hadley Newhouse moved to Good Hope three years ago and has carved out a place for herself, becoming a well-liked and valued member of the community. Working at Ami Bloom's bakery, she's become good friends with all four of the Bloom sisters. She's also had a front row seat for viewing the crumbling of David Chapin's marriage and the impact it's had on both David and Brynn, the man she's drawn to and the adorable child who, unknowingly, reaches in and squeezes Hadley's heart each time they meet. When the bakery closes for renovations, leaving Hadley at loose ends for a couple months, David steps in and asks her to be Brynn's temporary nanny. It's a dream come true for Hadley and with all of them living in the same house, gradually, Brynn's and Hadley's bond strengthens and the casual friendship between Hadley and David begins to deepen into something more serious...more lasting. But David is wary of opening his heart to another woman after his ex stomped all over it and Hadley...well, Hadley is keeping secrets that could turn it to stone. I thoroughly enjoyed David and Hadley's story (hence, the half-night reading marathon) and the opportunity to catch up with other couples from Kirk's Good Hope series. Each time I pick up a new Good Hope book I feel like I'm returning home for a visit with good friends. I've always liked both David and Hadley and have been intrigued by the hints Kirk has dropped about them in earlier books. I expected their journey to be emotional but Kirk took the story in directions I hadn't anticipated, making it an even better, more complex, reading experience and leaving me even more deeply invested in the happiness of not only David, Hadley, and Brynn but others in Good Hope as well. This is the sixth book in the Good Hope series and will stand on its own but these characters - primary and secondary - and their stories continue to evolve throughout the series. For my money, starting at the beginning will give you a deeper understanding of the many threads that weave throughout and a much richer reading experience. Have you read any of Cindy Kirk's books? Do you prefer to read a series in order or are you willing to jump in at any point along the way? What's the last book that kept you up reading half the night? I prefer to read in order, but not a necessity. Stayed up all nite reading - The Wicked Billionaire - Jackie Ashenden. I've not read Jackie Ashenden. Will check that out. And no I have not read any of Cindy's books. I prefer reading a series in the order that they're released. I've been up most of the night reading Shana Galen's "Third Son's a Charm". No need to enter me into the contest as I don't read contemporary romance. I loved Third Son's a Charm! Now I'm eagerly anticipating book two, No Earls Allowed. It comes out March 6. I've read all of the Good Hope books and enjoyed them. I discovered when I checked out her backlist that I had also read a couple of others as well. I'm the same, Janga. I like to read in order. Did she ever write for Silhouette? If so, I think I read a book by her and enjoyed it. She did, Kim. She wrote for Special Edition. No, I have not read this author. I don't have to read series books in order. I am up late, have a problem sleeping but it was probably a suspense book, read so many. Good suspense books have a tendency to keep me up very late! I have read this series. I read them in order, but in most series, that is not necessary for me to enjoy them. You are right, when you say Good Hope is like a home town. I stayed up late reading Jude Deveraux's Just Curious. It is a novella, and thought I could start it and then go to sleep....I was wrong. I had forgotten how much fun Ms Deveraux's books are. It has been awhile for me to read a book by her, and I need to correct that. I haven't read Deveraux in a while though her early books were among my favorites. I have not read anything by Ms. Bloom. I love the home town stories. I prefer to start at the beginning of a series and read in order. This sounds like a great series. I've enjoyed all the books in the series. Hope you give them a try, Trish! I have not read any book by her but I have to read the books in order. Otherwise you will miss out on the little intricacies. The last book that I read that I couldn't put down was The Great Alone by Kristin Hannah. I own a number of Cindy Kirk's Good Hope books but haven't had a chance to read them. There's doesn't seem to be enough time to rread all of the books I want to read. I'm not sure which book had me staying up late to finish but I thinking it was Jennifer Gracen's Between You and Me. Cindy Kirk is a new to me author. I enjoy books set in small communities. It is nice to have characters reappear and interact in subsequent books. The community often has its own personality and influence on the characters and story. I have picked up a book in the middle of a series, but prefer to read them in order. I will often wait to read a series until I have all the books. Then I'll have a binge reading session. For really good authors, that translates into many late nights. The last book that kept me up was B. J. Daniels' COWBOY LEGACY. I was sick with a virus and started the book in the afternoon. Just couldn't put it down. She is one of my favorite authors. Before that, it was Linda Broday's To Marry a Texas Outlaw. It was the last book in a series and I had to finish it. Linda's books are like that. I have read at least one of Cindy's books. I haven't read any of Cindy's books yet & I do prefer to start a series at the beginning. I get caught staying up too late reading too. This author is new to me. The last book that had me up was Dirty Little Secrets by Liliana Hart.